We’re entering the best time of year to catch big fish. In fact, Fall is just a good time for fish in general. Fish of all sizes go on the bite as the water starts to cool and the days get shorter. They instinctively know that, in many areas, their metabolism is going to slow down and they won’t be chasing food like they have been for the past several months. They need to put some fat on now to get them through the winter. Largemouth bass in many regions get pretty aggressive in the Fall. Here are some ways you can improve your odds of catching a truly big largemouth bass before the lakes and rivers ice over. First of all, realize that in most bodies of water, the bass are going to be close to deeper water. They might be in the deep water, or they might be in shallow water that’s close to deep water. They like to be close to a deep water sanctuary in the fall. In a river they might be up on grass flats, but the grass flats close to the channel will be the best areas. In a lake, they might be in the rushes, but the rushes that provide quick access to deep water will be where most of the bass are. If the bass are in the shallow areas, they will most likely be willing to eat your bait. This time of year, when the fish are shallow, they’re going to be on the bite. Shallow water fish can be spooky, so make long casts. Through the years, a spinnerbait, something like a Northland Reed-Runner or a Strike King Tour Grade have seen lots of time on the end of my line when the bass are in the rushes. 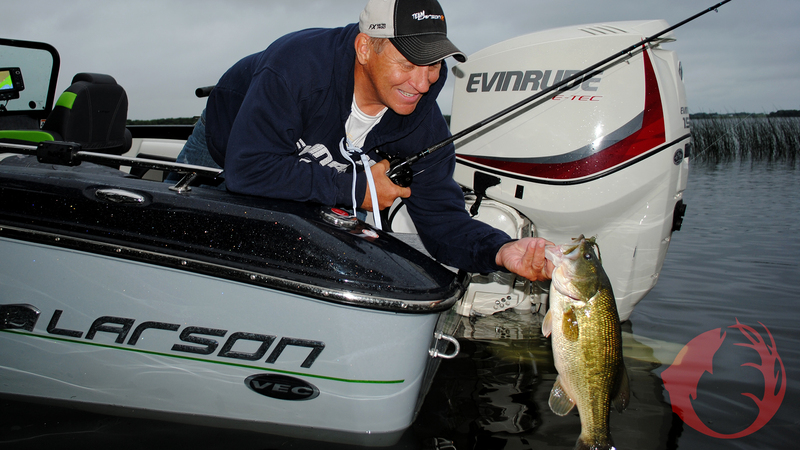 Choose a bait with a larger than ordinary blade, and add a bulky trailer. A 3.5 inch Impulse Paddle Shad would be a good trailer to start with. You want something that’s big and throws a lot of vibration. Big bass like a big bait this time of year, and the additional vibration from the larger blade will call the bass in from farther away. While spinnerbaits have taken a lot of bass for me in the past, and they still do, more and more I’m throwing a swimming jig, maybe a Hack Attack or Jungle Jig tipped with a bulky tail. A four inch Rage Denny Craw would be a good trailer choice. On the spinnerbait or the swimming jig, I like the trailer to have a little contrast in color with the skirt on the bait. The swimming jig is pretty much the same as the spinnerbait except it has no blade, and we fish it very similarly around the same cover as the spinnerbait. When the bass move out of the shallows, pay attention to the areas that drop off from the shallows the quickest. This is crankbait territory. Sometimes the bass will be right on the bottom at the base of a weedbed, other times they’ll be suspended up a bit. And there are also times when they’ll move away from the drop-off and relate to suspended baitfish like shad or bluegills. Tie on a Strike King Pro Model crankbait in the 4 or 5 size and start casting. Experiment with colors until the fish show you what they want. Subtle colors in clear water, something brighter on cloudy days. The last consideration is the body of water that you choose. Select a lake that has a history of big fish. This is big fish time, go where they live. Maybe we’ll see you there. Photo: It was an overcast autumn day when Mike Frisch found this nice bass and many others in shallow rushes. Swimming jigs were what they wanted.